This rare polypore needs a haircut. 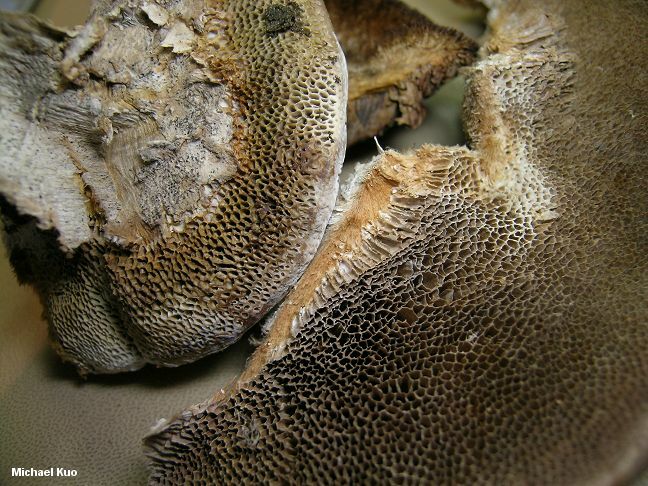 Its cap surface is not just "tomentose" or "hispid" (to use the well-behaved terms of official mycology), or even "hirsute." No, Coriolopsis gallica is downright hairy and unkempt. 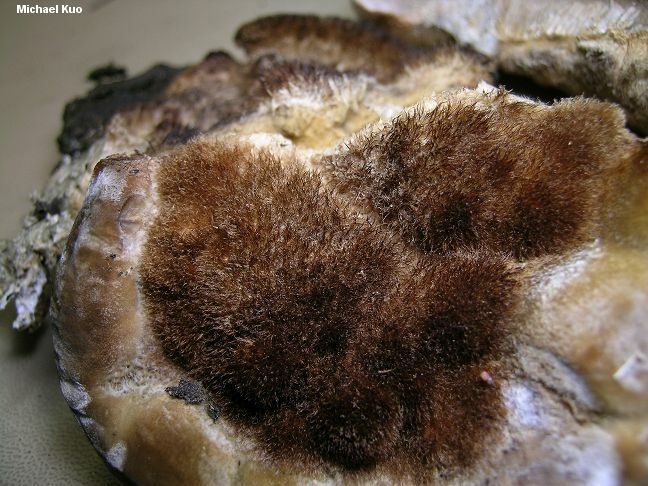 It is a widespread decomposer of the deadwood of willows and cottonwoods, characterized by its hairy cap, its gray to grayish brown pore surface, its large and distinctively angular pores, its rusty brown flesh, and microscopic features (see below). 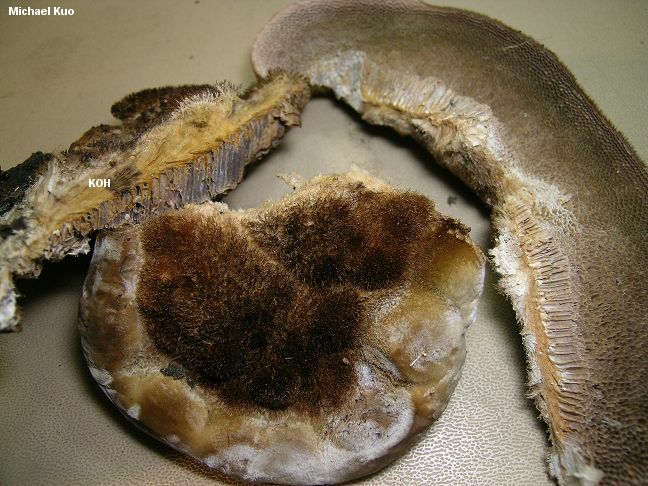 Trametes hispida in the sense of some North American authors (eg E. C. Smith, 1930; Overholts, 1953) is a synonym. Ecology: Saprobic on the deadwood of willows and cottonwoods (and occasionally other hardwoods); causing a white rot; also parasitic on apple trees in orchards (at least in Colorado; see E. C. Smith, 1930); growing alone or gregariously; annual; summer and fall (and over winter in warm climates); widely distributed in North America but apparently absent in the southeastern United States. Cap: Usually present and well developed, but sometimes present merely as a folded-over edge above a spreading pore surface; up to about 20 cm wide and 10 cm deep but usually about 10 cm wide; convex; semicircular, bracket-shaped, or somewhat irregular; sometimes fused laterally with other caps; brown to grayish brownish or gray; densely hairy, becoming bald on the margin. Pore Surface: Gray to gray-brown; not bruising, but discoloring reddish brown in places; with angular, 4- to 6-sided pores 1-3 mm wide, becoming elongated and jagged (and sometimes nearly maze-like or gill-like in places) with age; tubes to 15 mm deep, often paler than the pore surface or the flesh. Flesh: Rusty brown to dull brown; corky or tough and leathery. Chemical Reactions: KOH dark gray to black on flesh--fading slowly back to the original color. 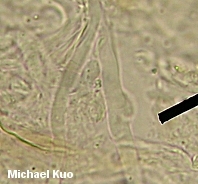 Microscopic Features: Spores extremely variable in size, even within a single mushroom; (8-) 10-16 (-21) x 3-5 µ; smooth; cylindric; inamyloid; hyaline in KOH. Cystidia absent. 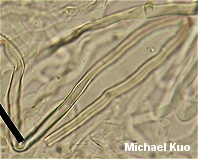 Hyphal system trimitic, with thin-walled, hyaline, clamped generative hyphae; thick-walled, golden, tortuous binding hyphae; and thick-walled, golden, aseptate skeletal hyphae. REFERENCES: (Fries, 1821) Ryvarden, 1973. (Saccardo, 1888; E. C. Smith, 1930; Overholts, 1953; Breitenbach & Kränzlin, 1986; Gilbertson & Ryvarden, 1987.) Herb. Kuo 08120705.